The Ultimate Lemon Cake- a lemon lovers dream! The Ultimate Lemon Cake. With 5 different lemon elements, this cake makes the ideal celebration dessert for the lemon lover in your life. With 5 different lemon components to this cake, it is not hard to see why I have dubbed it my ultimate lemon cake. I start with a homemade lemon scratch cake which gets brushed with some tangy lemon syrup, then filled with alternating layers of rich lemon curd and lemon buttercream frosting before being covered in more of the lemon frosting and finally garnished with homemade candied lemon zest. 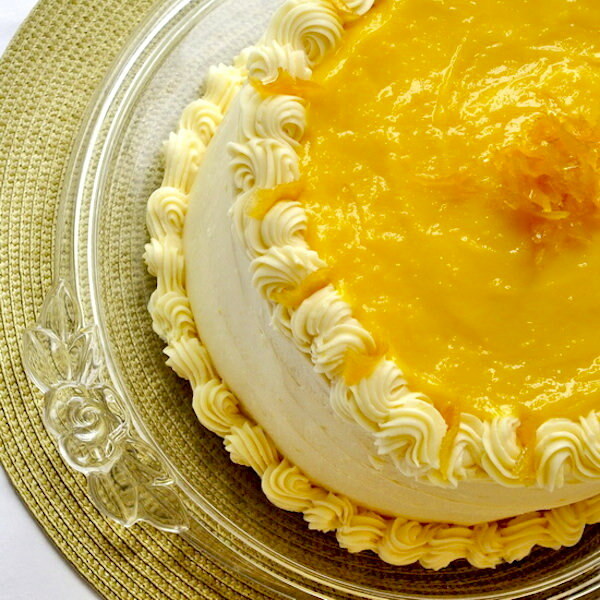 This is the perfect celebration cake for that lemon lover in your life. 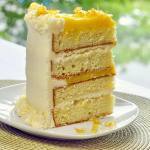 Like this Ultimate Lemon Cake recipe? The Ultimate Lemon Cake - with 5 different lemon elements, this cake makes the ideal celebration dessert for the lemon lover in your life. Sift together the cake flour, baking powder and salt and set aside. Add the eggs, one at a time, beating well after every addition. Gently fold in the dry ingredients in three equal portions, alternately with the milk. When adding dry and wet ingredients alternately in any baking recipe, always begin and end with the dry ingredients. Pour batter evenly into 2 well greased and floured 8 inch cake pans. Bake in a 325 degree F oven for about 35-40 minutes or until a toothpick inserted in the center comes out clean. Watch it carefully, you will not want to over bake this cake, as soon as the toothpick comes out clean, remove the cake from the oven and let it rest in the pans for 5 minutes before turning it out onto a wire rack to cool completely. Using a very sharp vegetable peeler remove the outside zest of 2 large lemons in large strips, avoiding the white part of the peel as much as possible. Add to a very small pot along with the lemon juice, sugar and water. Simmer together gently for about 15-20 minutes. Remove zest and let it drain on a wire rack. Reserve about half the syrup to brush on the cake layers. Using an electric mixer on low, mix the butter and icing sugar together until the butter breaks up and get evenly dispersed throughout the sugar in small pieces. The mixture will still appear dry at this point. This stage ensures even distribution and prevents butter lumps in your frosting. Add the vanilla extract, lemon zest, lemon juice and milk. Both of these liquid measures can be adjusted. The milk can be adjusted to make a thicker frosting by adding less or a more spreadable frosting by adding a little more. Use your own judgement here. The lemon juice can be adjusted to your own taste too.When the icing reaches the desired consistently continue to beat it on high speed for 5 minutes to incorporate more air into the frosting to make it lighter and fluffier. Split the two layers of cake horizontally to create 4 layers. Brush the reserved syrup onto the cut sides of the cake layers. Place the first layer of cake on the cake plate and top with some of the lemon buttercream frosting. Add the next layer and using a piping bag, or a heavy plastic bag with a half inch opening snipped off the corner, pipe a ring of frosting around the perimeter of the cake. Fill the ring with half of the lemon curd. Add the next layer of cake and top with more of the frosting. Add the final layer of cake. At this point frost the sides of the cake and pipe a border on the top and bottom. Add the second half of the lemon curd to the top of the cake and garnish the top of the cake with pieces of candied lemon zest. I use kitchen scissors to cut 1/2 inch pieces to decorate the border and then add a small pile of slivered zest to the center of the cake. Chill for several hours or overnight before serving. Oh my…this looks divine! I love lemon…it’s my favorite! I am a lemon lover and this sounds heavenly! Can’t wait to try this recipe. Thank you! WOWZERS….My fiance LOVES my lemon meringue pie. Wonder how gaga he would go over this!? Made this for the wife’s birthday this past weekend…minus the candied lemon peel; but WOW what a cake! My wife has a part time cake decorating business (I had some big shoes to fill) and she was blown away! …made a slight change to the icing mixture with the addition of salted European Cultured butter and man did the lemon EVER POP! Ohhhhh, you are such a sweetie!!!! I made this cake for a friends birthday last weekend to say is looks and tastes A-MA-ZING is an understatement! Oh this is to die for. I love all things lemon! My one negative with this recipe is the lack of a list of ingredients (Unless Im missing it) meaning I have to go through the recipe and write down each item…add them up and then produce a list…odd to be missing such a standard inclusion. I’ve found people prefer to have the ingredients where they appear in the preparation rather than the list first format. I understand your point but it is a matter of preference. Cake flour may also be sold as pastry flour. I believe it was a number 22 tip that I used for the borders. I’m looking for a lemon cake recipe for my husband’s birthday, and this looks like it will fit the bill nicely! About how long does it take to make – baking and prep time? And with time to ice and cool about how long do you think I should leave myself to complete the entire project? I don’t time myself but depending on your skill level I’m guessing 3-4 hrs? I am making this recipe right now for my bday cake tomorrow. I have all of the components ready for assembly and I’m so excited about it.. I LOVE lemons so I think this is going to be the best bday cake yet!! I don’t know if I’ll be able to achieve such a gorgeous ‘presentation’ as yours, but I’ll do my best! Thanks for the great recipe! I made this for a baby shower I hosted, made it cute with a baby buggy I freehand piped on top of the lemon curd. It was a big hit, but in my opinion my cake was a bit dry. Luckily the lemon curd added the moisture it needed. Unfortunately, I over cooked the lemon peel candy and the syrup was very thick once it cooled. I wasn’t able to brush it on the cake layers — also a culprit for the cake moisture issue. This is recipe is good and I would make this again, maybe take the cake out of the oven sooner and try to make the candy lemon syrup right! I’d say 16. I usually say 12-16 for cakes but this one should be at the upper end. could this be frozen? I have a party for a large number of people and we want to have everything done ahead of time. I’ve never frozen lemon curd I don’t think. No, we generally don’t use self raising flour in North America at all. I’ve only ever seen it in a supermarket once. Cake flour is a softer and finer flour than bread flour or all-purpose flour. It is what gives this cake its unique texture. I made this for a party I’ve been to, it looked amazing and tasted so good, the flavour and the texture of the cake was so perfect….lemon flavour in every bite. Felt really proud of it. 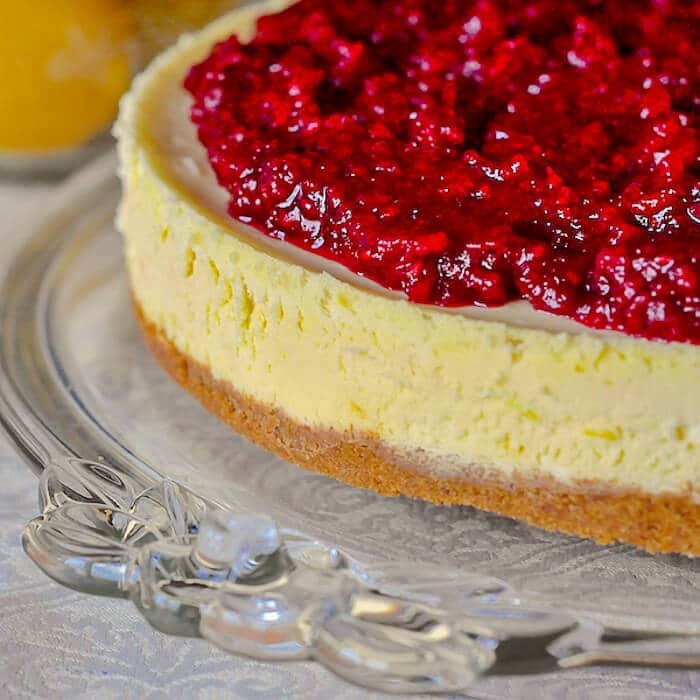 I’ve found many curd recipe using whole eggs instead just yolk , can you recommend to use just yolks or whole eggs for better result and make the perfect cake for me. Can I use lemon cream cheese frosting instead of just lemon frosting for this cake ? Sorry for too many questions. I always have used just egg yolks for a perfect curd. Frosting is always a personal choice. Hi Barry , any substitute for evaporated milk ?